The names of suspects involved in the downing of Boeing Malaysian airliner MH17 over occupied eastern Ukraine during July 2014 will be revealed as soon as suspects are notified of suspicion, deputy head of Ukraine's Prosecutor General's Office (PGO) Yevhen Yenin has said. "This is absolute nonsense and the work of hostile propaganda. All names will be released as they are notified officially. We are not talking about 120 individuals – this is Moscow's attempt to distract attention away from information about the Smolensk tragedy," he told the Kyiv-based Interfax-Ukraine news agency on Tuesday. Yenin said on his Facebook page: "The governments of Ukraine and the Netherlands continue to coordinate efforts with the aim of bringing those persons/states responsible for the terror act over the skies of Donbas to justice." 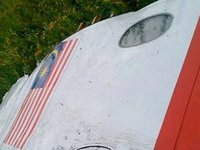 Earlier, a number of Russian media reported that on January 2 the Netherlands will disclose the names of those involved in the downing of the Malaysian Boeing. At the same time it was pointed out that the investigation established the names of 120 people involved in organizing and carrying out the terrorist attack against the crew members and passengers of the flight.